All transactions are safe and secure with a reliable history in online purchasing behind each of our associates. 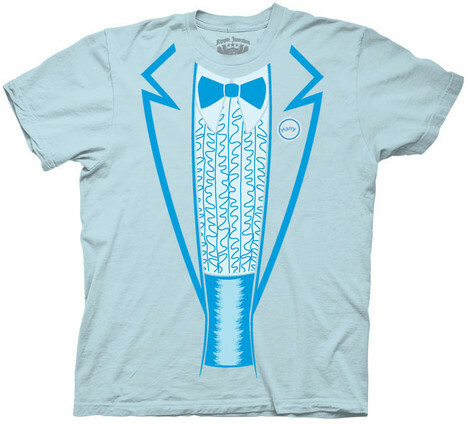 Buy the Harry's Powder Blue Tuxedo t-shirt to own Dumb and Dumber clothing and merchandise. This powder blue tuxedo t-shirt is not just a hilarious Dumber and Dumber shirt, it's also a Harry Dunne costume. If the formal benefit scene was one of your favorites from the movie, then check out the Dumb and Dumber costumes and Nice Hooters shirt. Either would make you the hit of a party. If you enjoyed the Harry and Mary skiing scenes, scope out the A Little Place Called Aspen t-shirt. It isn't as loud as this blue tuxedo costume and it reminds fans of the breathtaking scenery. In addition to the Harry's Powder Blue Tuxedo tee above, browse the Dumb and Dumber Clothing Gallery for more apparel like men's and women's clothes, kids shirts or hoodies.